The wind on the King’s Road blew strong and smelled of an early spring. Already the bogs and marshes to the west were growing ripe. The stink of the lowlands reminded Paul of a privy. Impatient, he searched for signs that banners would soon come around where the road curved through the forest on the east. Pine forests made it impossible to see and he sat back in his saddle. Rock, his black destrier, barely moved as he sat. The horse was well trained and fierce in battle, if it came to that. Paul hoped it wouldn’t. His father had named him Knight a month ago, but his sword remained undrawn in combat. Maybe they won’t come, maybe the Weaver will be merciful. His Squire, a young man of sixteen named of Jack, held his banner straight despite the wind. The deep blue fabric flapped as another gust of wind took it, causing the black raven emblazoned on it to ripple and soar. 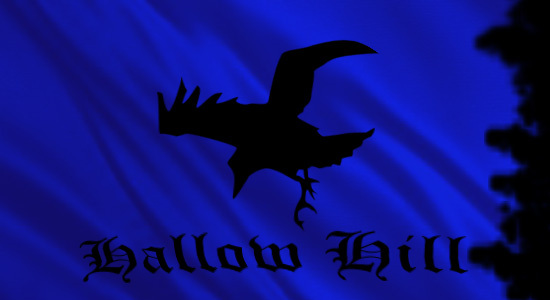 It was the banner of House Halloway, his House. One day he would be expected to take his father’s title as Lord of Hallow Hill, but no son could inherit without being tested. He was almost eighteen and never blooded. His fingers flexed inside his leather gloves and twisted the reigns. “They’re late,” he grumbled, rolling his shoulders to ease the weight of his breastplate and mail. He was a thin boy and small, and the weight was only gone for a moment before it all came crashing down on his shoulders again. Paul grumbled. Jack was nearly as tall as Loukas and just as big and broad. If Paul didn’t wear the ring of his title, some mistook him for the Squire and Jack for the Knight. “They’re coming!” Jack said. Paul stood in his stirrups and the hundred men behind him began to stir. Some were his father’s other Knights, others simply sworn swords, but all were his men. Every one of them carried sword and shield and lance. Many of their horses were barded in gilded chain enameled dark blue, like the mail worn by the men. Rock had plate added to his barding, making his head seem to be that of a raven’s instead. Paul tightened the grip on his reigns and chewed on his lip. Anger and fear burned in his chest. He had come to make peace in his father’s stead. His father was sick with a fever and spasms so violent that the physicians fear he may have the Shaking Disease, but Paul knew that was a commoner’s ailment and his father was anything but common. They moved forward under his uncle’s direction, slow but steady and disciplined. All the lances in his men’s hands were held straight up, an angle of peace, but ready to drop into a war stance at a moment’s notice. Paul licked his dry lips and scratched at his neck where his padded coat chaffed. “Paldors I believe.” The Paldor House didn’t worry him nearly as much as the other two banners. He saw them plain now himself. “He also rides with the Thunder Company and House Pike.” He stopped Rock and halted the line, calling back to his uncle. When the older man came up, he quickly told him the banners on the horizon. “An ambush then?” Loukas asked, a hand falling on the hilt of his sword. Paul felt a rising anxiety, the sudden spike in fear making his lungs tighten and wheeze. When Jack asked why he was so worried, Paul told him. “He brings the Thunder Company. They raided my father’s merchant wagons just last year and raped my cousin Tessa. She was to wed Lord River’s second son in Sea Gate. No chance of that now.” Paul gritted his teeth, ashamed that his fear overwhelmed any anger he felt. This entry was posted in Fantasy, Original Fiction and tagged Fantasy, Hallow Hill, Paulin Halloway, Saga of Aranor. Bookmark the permalink. The untested noble in a testing situation; thank goodness for the (hopefully) support from his uncle.